Show US the money: Will Rahul Gandhi’s MIG-19 fly? 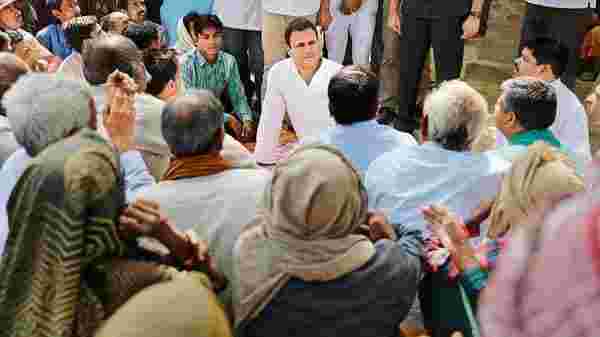 Earlier this week, Congress president Rahul Gandhi took some inspiration from Martin Luther King, the American civil rights movement leader, and promised minimum income guarantee in 2019 (MIG-19), to the poor. Of course, this is condition to the Congress being voted to power. With Gandhi firing the MIG-19 salvo, it remains to be seen what the Narendra Modi government does to tackle this in the interim budget, which will be presented by finance minister Piyush Goel today. In the recent past, there has been a lot of talk around the idea of universal basic income. But Gandhi’s proposal is not that of universal basic income (UBI). UBI is basically a small amount of money paid every month to every citizen of a country, without any terms and conditions. Let’s say the proposed MIG-19 scheme sets a cut off of ₹60,000 per year (or ₹5,000 per month). All households earning less than this will be eligible for the scheme. A household earning₹50,000 per year will get a payout of ₹10,000 per year. And a household earning ₹25,000 per year, will get a payout of₹35,000 per year. So, poorer a household, the more money it will get from the government under MIG-19. There is tremendous inequality that prevails across India. Goa is the richest state in India and Bihar is the poorest. In comparison to richer large states, the per capita income of states like Uttar Pradesh and Bihar, is very low (see Chart 1). The per capita income of Bihar in 2017-18 stood at around₹38,860. This is just a little over ₹3,000 per month. 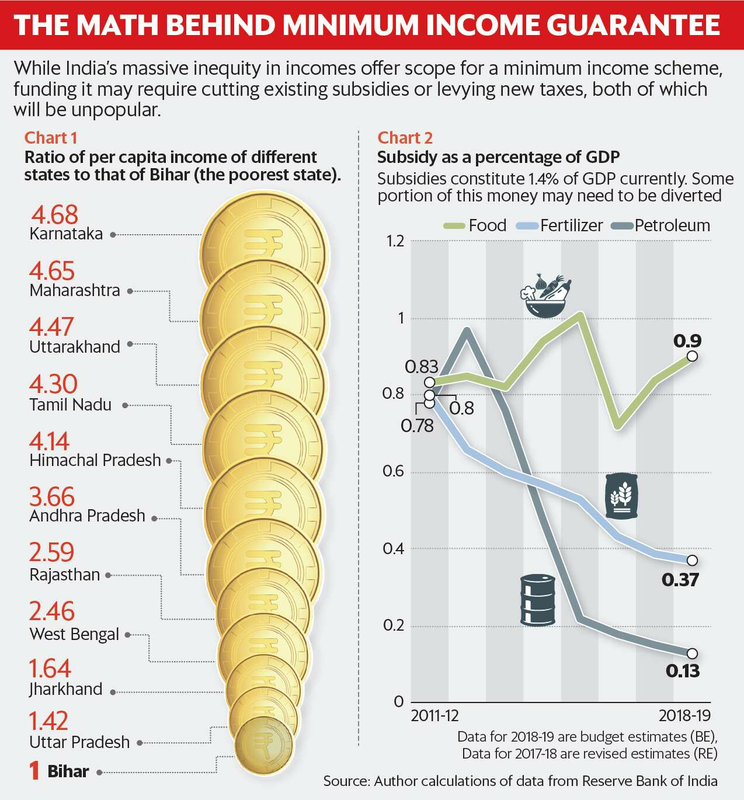 In case of Uttar Pradesh, the second poorest state, the per capita income amounted to ₹55,339. Among the richer states, for which 2017-18 data is available, Karnataka with a per capita income of around ₹1.82 lakh, came on top. The details that are available as of now seem to suggest that some sort of cut off (perhaps income) will be used to arrive at the section of the population who will be eligible for MIG-19. Chances are those for whom the scheme is meant, work in the informal economy and are largely paid in cash. How do you figure out their income? Also, some sarkari babu somewhere will need to determine who is eligible for MIG-19 and who is not. This immediately increases the chances of corruption or rent-seeking. The other big problem, as Standing writes: “The incomes of many low-income households vary from month to month and week to week.” How will their actual income be figured out? Using income criteria for a cut-off will also lead to a Type II error. In other words, some of those actually eligible for the scheme will not be a part of it, because of their inability to prove that their income is below the cut off. Hence, the final cut-off will be important. Other parameters like ownership of land, kind of house, etc. can be used. But the data in these cases is also not very easy to get. This is why many economists the world over tend to favour UBI for countries like India, where there is no need to figure out who is eligible and who is not, because everyone is. Pranab Bardhan, a professor of economics, at the University of California, Berkley, wrote a few years ago that for nations like India, UBI made far more sense than the complicated task of figuring out who is poor. The problem is that any form of UBI is going to cost a lot of money. This is not to say that MIG-19 is going to be cheap. Like is the case with any good political rhetoric, the details of MIG-19 aren’t currently available. Given the lack of details, coming up with even a back-of-an envelope calculation for how much MIG-19 will cost, is difficult. Having said that, the Congress party would want to cover a significant proportion of the population and the bill for this could easily run into a few lakh crore. In the Economic Survey of 2016-2017, it was pointed out that a programme which targets a 75% universality, and pays ₹6,540 per year per person (the reasons for which are explained in the survey), the total bill would work out to 4.9% of the gross domestic product (GDP). Considering the forecasted GDP for 2018-2019, this works out to around ₹9.2 trillion. Given that MIG-19, is not a UBI, the overall bill will be much lower than this, but it will still need a lot of money. In interviews to the media, Praveen Chakravarty, head of the Congress data analytics cell, has maintained that MIG-19, will be fiscally prudent. This basically means that the Congress party, if it comes to power, will look at ways to rationalize expenditure as well as think of new revenue streams, in order to finance MIG-19. If we look at the history of UBI in India, most economists who have supported it, have talked about doing away with subsidies and looking at newer sources of government revenue. Let’s talk about subsidies first. As can be seen from Chart 2, food and fertilizer subsidies in 2018-2019 are projected to be at₹2,39,402 crore or 1.27% of the GDP. Even if a part of this is done away with, it will create problems. Any move to cut down on fertilizer subsidies will be seen as an anti-farmer measure, even though it’s largely rich farmers who benefit. Cutting down on food subsidy, will be trickier. To start with, how will any politician sell it to the people? Moreover, the Food Corporation of India (FCI) buys rice and wheat directly from farmers at the minimum support price (MSP), announced by the government every year. It then sells this rice and wheat at a fairly low price through the public distribution system (PDS). The government then compensates FCI through the food subsidy allocated in the annual budget. If food subsidy is cut, it would basically mean that the FCI will no longer sell rice and wheat through the PDS or will not sell as much as it was selling before. The question is then what happens to the entire system that is in place.Will FCI cut down on buying? Will parts of PDS be shut? There are states where PDS works reasonably well. Will it be politically and economically expedient to stop it in these states? These are tricky questions. Also, there is the question of what happens toMGNREGS (Mahatma Gandhi National Rural Employment Guarantee Scheme), which is an income guarantee scheme, as well. As far as raising new sources of revenue is concerned, there are several things that can be done. Along with every budget, the government puts out a Statement of Revenue Impact of Tax Incentives under the Central Tax System. This is the successor to the Statement of Revenue Foregone. For 2017-2018, it has been estimated that the revenue impact of major tax incentives for corporate taxpayers stood at ₹85,026 crore. The same figure for individual and HUF taxpayers stood at ₹76,581 crore. When it comes to central excise duty and customs duty, the data is available only up to 2016-2017. In that year, the revenue impact of major tax incentives stood at ₹1,46,264 crore. While, it is easy to point out that such exemptions exist, it won’t be so easy to do away with them. Then there are public sector enterprises. Vijay Joshi, Reader Emeritus in Economics, University of Oxford, in his book India’s Long Road estimates that the value of enterprises owned by the government is around 40-45% of the GDP. The problem is that in all these years, no government has really managed to sell public enterprises to private companies, which is where they can hope to earn a good premium over the prevailing price. If the government gets around to the idea of selling public sector enterprises, a lot of money can be raised to finance the MIG-19. Also, this would mean that the government cannot keep rescuing loss-making enterprises like Air India. The socialism for the rich will have to end. Some tough decisions will have to be made. One thing that might just work, and which has been suggested both by Joshi and the entrepreneur Rajesh Jain, is the sale of land owned by the public sector enterprises. This is something that will not be equated to the sacrilege of selling silver jewels, as public sector enterprises are looked upon. Other suggestions like reintroducing a wealth tax have also been made. Wealth tax is difficult to implement and has never really managed to raise a lot of money. Some commentators have also suggested an estate tax or a tax levied on assets left to heirs. While this might make sense from the point of view of intergenerational equity, it is a political hot potato. A similar hot potato is a tax on agricultural income above a certain level, something Joshi believes will help raise revenues of up to 0.5% of the GDP. Financially, this makes sense, given that only the rich farmers will be paying this tax. But politically it will be hara-kiri for anyone suggesting it. All told, MIG-19 makes sense from the political viewpoint and the state of the nation, but it will be difficult to finance it and remain fiscally prudent at the same time. It will need a strong-willed leader to push anything of this kind through simply, because there are existing systems in place and they will have to be rattled to get MIG-19 going.